The Buxton Powder House was built in 1813 to store gunpowder and militia supplies. The landmark on Long Plains Road could be focus of an event in 2022 when the town celebrates its 250th birthday. 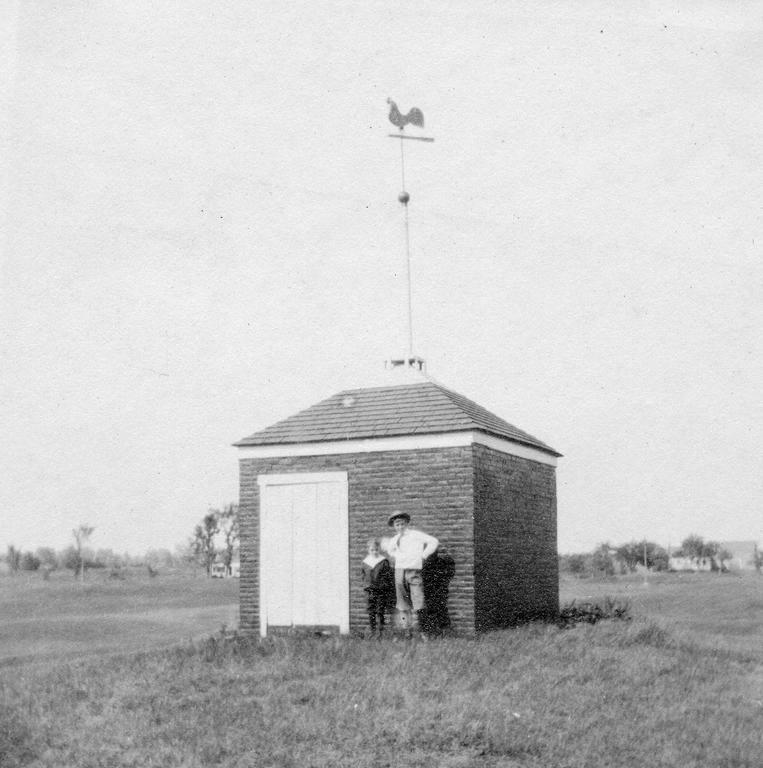 The boys in the photo, taken about 1920, are unidentified, and the rooster weathervane was stolen years ago. Buxton — The town is gearing up for a big shindig, “Buxton 250,” a birthday celebration in three years. Poitras has lined up a cast of helpers, including Town Clerk John Myers, Recreation Director Nicole Welch, and historians Brent and Jan Hill, and he’s hoping more volunteers will step forward to assist in the planning. “We’re looking for Buxton residents,” he said. While the town is planning its 250th birthday, Buxton took root decades earlier than 1772. Then known as Narragansett No. One, it was one of several land grants from the General Court of Massachusetts promised to colonial soldiers, or their heirs, who fought against the Native Americans in King Philips War 1675-1678. The land grant was authorized in 1728, according to the town. Maine before becoming a state in 1820 was part of Massachusetts. Brent Hill, past president of the Buxton-Hollis Historical Society, said surveying of Narragansett No. One came in 1732. A book, “Buxton Centennial,” published in 1872, said 11 men and “probably most of them married,” were in town in May of 1742. The book also said Amos Chase was one of the earliest settlers and left in 1744. According to a Buxton booklet, “Bicentennial 1772-1972,” the Massachusetts House of Representatives voted in 1743 to build a garrison in Narragansett No. One and it was believed to have been constructed at Pleasant Point. Hill said the earliest settlers located in the Salmon Falls area but were “driven off” by Native Americans. The bicentennial booklet described Narragansett No. One as a frontier. After hostilities diminished, settlers began arriving again about 1750, according to historical accounts. Hill said early families included the Woodmans and his forebears, the Hancocks. The bicentennial booklet said the earliest church was built at Salmon Falls in 1742. Paul Coffin was the first settled minister into town , said Jan Hill, historical society president. Coffin’s ordination in Narragansett No. 1 was in 1763, according to the bicentennial booklet. Landmarks are plentiful in Buxton as are stories of its past. Poitras said brainstorming has begun for the upcoming celebration. Events could be concentrated in a single weekend in the summer of 2022. Those wishing to volunteer to help observe the town’s sestercentennial should call Poitras at 590-0537.